Pat Mastelotto : " A Diifferent Drummer"
Pat Mastelotto is perhaps best known as one of the drummers who have been in King Crimson over the years. He's been involved in plenty of other musical projects as well - from playing in Mister Mister to working with XTC, The Rembrandts (remember the theme to Friends? ), Matthew Sweet and a lot more. I got the chance to ask him about the current state of King Crimson, his other projects and a lot more. Mastelloto is definitely a busy guy - and one with his hand in a lot of musical pies. WORMWOOD CHRONICLES: You are always a very busy guy involved in a lot of different projects. I know you are part of the Stickmen. Can you give us some information on what that is and what you guys have been up to? 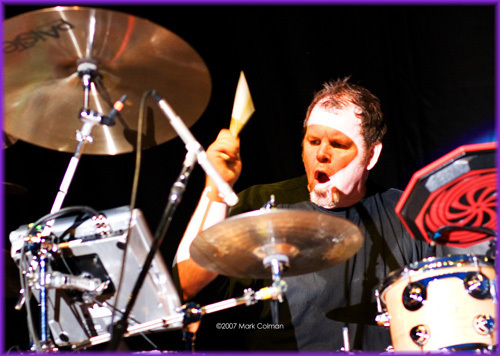 PAT MASTELOTTO: The idea of Stick Men was Tony Levin's. It's just the three of us: Tony, Michael Bernier, another Stick player who is also a drummer, and I. We are touring a lot, surprisingly. Tony had the idea after doing his Stick MAN record, eventually we got a gig at a Polish drum festival and had a few days to rehearse and then did our first shows. Later we did dates with UKZ, then another five weeks all over Europe, then a run on the east coast. Next week we're going to Sweden November 8th to spend a week at the IB festival. Then we play a few more Swedish gigs on our own. Then we join Porcupine Tree for the last leg of their European tour. We are about eighty percent done with our first record but wanted something to take with us to Europe, so we're doing a limited edition release of the record in its current state--then next year we will release the finished record to coincide with touring in North America. The main differences will be two or possibly three more songs that we just haven't had time yet to record. A few more overdubs, and sadly on one song we had a hard drive crash and lost most the parts so we had to use an mp3 for this advance record. Then on the full release, all the tracks will get a proper mix from Tony Lash. Tony and I mixed the advance release. Even the limited release is almost an hour of music. Besides lots of new material, we're including four movements of Stravinsky's "Fire Bird" in our style. Imagine it as a rock ballet. It's really been the joy of a lifetime to play on something like that! Tony has been working on that for a long time. He's been transcribing and arranging for a whole year! WC: Any King Crimson news? PM: You mean for live shows? Nothing ready for print yet. From a historic perspective, Steven Wilson of Porcupine Tree remixed several early KC records in 5.1. PM: People ask me that all the time and the truth is, I can't even remotely imagine a world where I wasn't involved in music. It'd be very sad.WC: What's ahead for you? PM: Hopefully, more of the same.WC: If you were a superhero, what music person would be your arch-nemesis and why? PM: I'm a drummer. I don't have an arch-nemesis and I wouldn't even if I was a super hero. WC:If you were in charge of assembling a music festival and wanted it to be the ultimate one from your point of view, who would be playing? PM: That list is too long. . .
PM: Just bought Porcupine Tree in Helsinki. PM: Put the seat down.